Welcome to Southeast Health Wound Care. Our professional staff is trained to provide a specialized, comprehensive course of treatment to assist in the healing process. During your treatment, we will work with your primary care physician to assure continuity of all your medical services. At any given time almost six million Americans suffer from problem wounds. There are many different types of wounds. Some are associated with diabetic complications and others to vascular disorders. Other types include pressure sores and traumatic wounds. It can be frustrating and take time to heal these wounds. We utilize the most up-to-date healing processes, including the region’s only hyperbaric oxygen therapy, and we remain current in new advances in wound care. Once a treatment plan has begun, you will follow a regular schedule for wound care. You will be instructed on how to administer your own wound care at home, as well as how to protect your wound from complications. You are the most important part of your healing process. Keeping appointments and following directions clearly are critical to attaining a positive healing outcome. 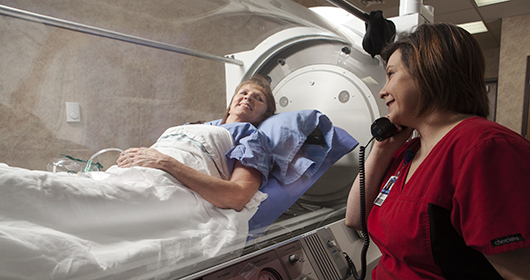 Hyperbaric oxygen therapy (HBO) is a medical treatment used to treat a limited but diverse group of illnesses. It is often used as part of a combined program involving nursing care, dressing changes, surgical debridement, medications and nutrition. During hyperbaric oxygen therapy, the patient is placed within a clear plastic chamber which is pressurized with 100 percent oxygen up to two to three times greater than normal atmospheric pressure. This increases the oxygen level in the blood and ultimately in the body tissues. Hyperbaric oxygen is a simple concept. By providing 100 percent oxygen in a pressurized chamber, we are able to deliver two to three times that which can be provided by breathing 100 percent oxygen at normal atmospheric pressure. This “hyperbaric” (or high pressure) dose of oxygen offers distinct therapeutic benefits.